The Japanese electronics giant, Rakuten, is a big brand and with its appealing tagline ‘shopping is entertainment’ it is the most coveted online marketplace, now. Having an alliance with this big marketplace is a must for every online seller. The e-retailers in order to cut through the competition are yenning for different channels of exposure and distributing their vast array of products across multiple platforms. That is why multi-channel online marketing is the buzzword. Do you aim to be a successful Rakuten seller? Cherish the idea of maximizing selling on Rakuten to add to your client base and have your products ever increase their reach to your potential buyers, facilitating this whole process of Rakuten integration and management is ChannnelSale. We with our bankable reputation act as the provider of ecommerce solutions and multi-channel marketing assistance for all sellers. ChannelSale can be your ultimate partner when you are seeking for exposure across varied online channels as it is in network with 200+ global shopping sites. With the help of ChannelSale’s Rakuten integration, the automated product listings of varied sizes, materials and colors becomes a seamless process. Rakuten inventory management along-with detailed product performance reporting analytics and product catalog feed management - all becomes a synchronized affair with our software solutions. Takumi Kawashima - Business Development Manager at Rakuten Commerce LLC. Why go for ChannelSale Rakuten seller software tools? ChannelSale’s automated Rakuten listing tool converts your existing product data feed into Rakuten’s specified product listing template across all product categories to have the feed files successfully validated from Rakuten, thus enabling your team to continue updating the product data in your existing file format and relying on ChannelSale to automatically convert the data in Rakuten format as you keep adding new products, modifying existing product data and eliminates the need for your team to maintain multiple file formats. ChannelSale can efficiently handle your Rakuten selling, taking charge of every situation from product feed optimizations, automated Rakuten product listings, and management to give your business a boost. We help in fulfilling your goal to be a successful Rakuten seller by offering apt real-time inventory management services so that your Rakuten store does not over-sell or under-sell the products. 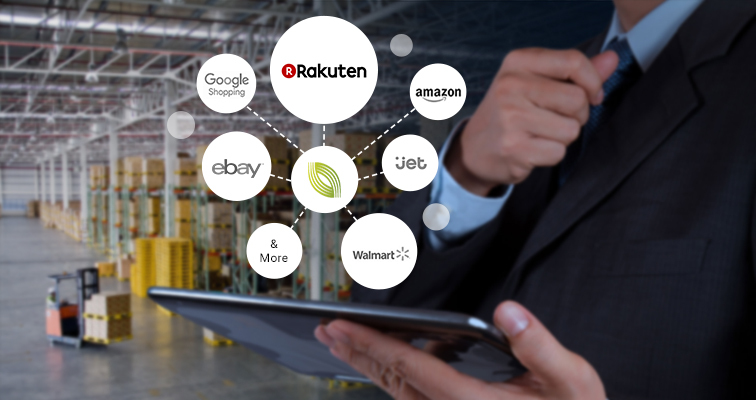 ChannelSale’s automated platform consolidates your Rakuten store orders and streamlines proper Rakuten order fulfillment while offering with accuracy Rakuten order shipping tracking updates. Also supports Multi channel automatic fulfillment by Amazon for your Rakuten store orders, or can sync up the Rakuten store orders and shipping tracking updates with your warehouse or suppliers or other third party integrations. Helps to keep check on the growth chart of your business, profit chart and product performance. Eliminates issues related to inaccurate data transfer as our software solutions keep fault at bay. We step in proactively so that your varied Rakuten product listing gets the right visibility and with us taking charge of Rakuten store, the management becomes easy for you. Our ace marketing pros and experts are always there to help you out in the Rakuten integration process. ChannelSale can create your product listings on Rakuten via your product feed file in formats CSV, TXT, XLS or API-XML and further synchronize them on Rakuten along-with all the other top online marketplaces, comparison shopping engines and affiliate networks. ChannelSale can integrate your product data feed to automatically flow in to Rakuten.com marketplace directly from your webstores such as Magento, BigCommerce, Volusion, Shopify, Yahoo store, AmeriCommerce, NetSuite, 3D Cart, Pinnacle cart amongst others. The Jet.com orders and shipping tracking updates can be synchronized with platforms such as Fulfilled by Amazon, SKU Vault, ShipWorks, ShipStation, StoneEdge, OrderMotion, OrderLogix, SOS Inventory and others. Granular level product category mappings to ensure your products get listed in an appropriate matching Rakuten product category. Have variable pricing for Rakuten and other marketplaces / shopping engines, or markup pricing over cost price or retrieve your Amazon / eBay pricing to be sent to other shopping engines. Custom product data attributes are supported. In order to optimize the product listings on the shopping sites, the best practice is to include product data for as many product attributes as available. Examples: Bullet point descriptions, search terms, video link, multiple warehouse inventory, gender, pattern etc. Real time inventory updates – avoids over-selling and under-selling issues. For example - If a product sells on Amazon, eBay, Sears, Newegg, Wish etc., the updated remaining quantity in hand would reflect in your ChannelSale account and further on Rakuten. Centrally manage all Rakuten orders and shipping tracking updates. Automate exporting Rakuten orders to third party order fulfillment platforms / Dropshipper’s, Fulfilled by Amazon, or to suppliers on an hourly basis. Setup to automatically retrieve order shipping tracking number on Rakuten. Thus you can rely on ChannelSale as we are here to help all Rakuten sellers take charge of their businesses, push up their profit graph and blanket their target market in a more effective way!